A Massachusetts native, Vaughn earned bachelor’s and master’s degree in aeronautical engineering from MIT. He worked for several aviation companies as well as Cummins Engine before joining Harley-Davidson as Deputy Group Executive for Motorcycle Products in 1975. Two years later, he was promoted to Corporate Vice President and Group Executive. The 1970s were one of the most challenging times in Harley-Davidson history. In addition to internal challenges related to quality, dealer support and overall morale, competition from international competitors was intensifying as the entire industry faced a declining market. In that environment, AMF, the parent company, was looking to get out of the motorcycle business. Vaughn worked to encourage AMF leadership to put Harley-Davidson up for sale and then spearheaded a team of investors (including 13 company executives) to buy the company from AMF for just over $75 million in a leveraged buyout. That “buyback” was impressive when considering that the company had gross sales of approximately $280 million along with substantial assets in Milwaukee, Tomahawk and York. 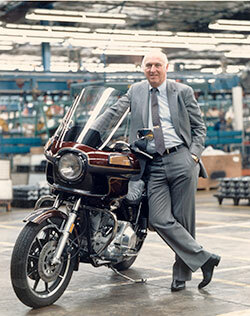 After the deal was completed in June of 1981, Vaughn assumed the position of CEO and began work to restore the company to its rightful place as an industry leader, in part by upgrading the company’s engineering and manufacturing processes and the establishing the Harley Owners Group (H.O.G.) in 1983. After fending off further financial difficulties in the mid-80s, Vaughn worked to take the company public in 1986, raising capital to fund product development of the Softail frame and Evolution engine that helped fuel explosive growth late in the decade. He served as CEO until March of 1989 and continued to serve as chairman until May of 1996. Vaughn is survived by his wife of 67 years, Eleanore, and numerous children and grandchildren. Everyone in the Harley-Davidson family sends our thoughts and prayers to the Beals family. He will be forever remembered by those that represent and love Harley-Davidson.